Clinical Reasoning is the process by which a therapist interacts with a patient, collecting information, generating and testing hypotheses, and determining optimal diagnosis and treatment based on the information obtained. It has been deﬁned as “an inferential process used by practitioners to collect and evaluate data and to make judgments about the diagnosis and management of patient problems"
Clinical reasoning is “the sum of the thinking and decision-making processes associated with clinical practice”. During this process, the therapist analyses multiple variables contributing to the patient’s limited physical capacity (the ability to execute a task or action in a standard environment) and performance (what the patient can do in his or her own current environment). The key elements of the process include generation of hypotheses of factors assumed to underlie the limitations of physical capacity and performance and postulation of the magnitude of those factors. The therapist interacts with the patient and other persons involved in the patient care (family, other health care professionals) and guides the patient in finding meaningful goals and health management strategies. All decisions and actions need to be made in line with professional ethics and community expectations. Clinical Reasoning is integral to physiotherapy practice. As a concept, clinical reasoning is quite a simple one however in practice, it is difficult and fraught with errors. The aim of clinical reasoning is to prevent misdirection  A robust clinical reasoning process is vital so the threshold of suspicion of serious pathology is at an appropriate level. The way a therapist clinically reasons their findings can strongly influence how the case is interpreted. This has implications as to how the clinician views the red flags and gives weight to any red herrings presented therein . 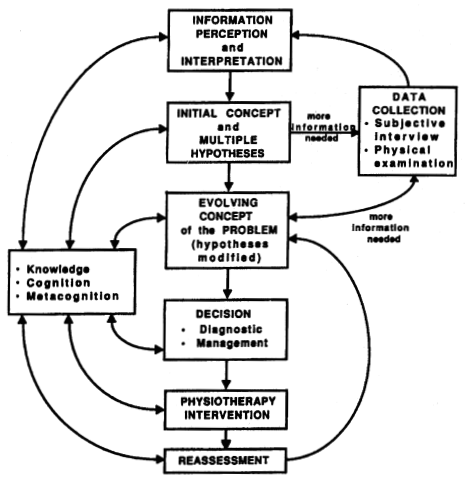 The most common form of clinical reasoning within the physiotherapy profession is hypothetico-deductive reasoning. Within hypothetico-deductive reasoning, the clinician gains initial clues in regards to the patients problem (from the subjective assessment) which forms initial hypotheses in the therapists mind. Further data is collected in the objective assessment which may confirm or negate the hypotheses. Continual hypothesis generation may occur during management and reassessment. Reflection after the initial assessment and also after the subsequent sessions will help the therapist to recognise patterns and their clinical reasoning process will improve. Clinical reasoning should begin as soon as the therapist meets the patient as their behaviour can inform the therapists clinical reasoning. There should be ongoing data collection which should not stop at the end of the assessment to aid this process. 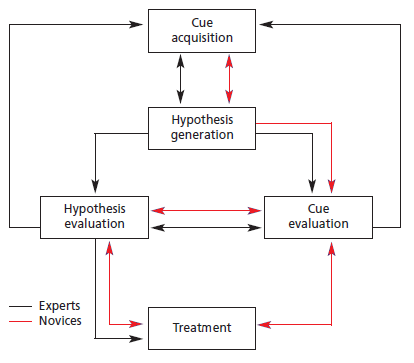 A hyptothetico-deductive model of clinical reasoning can be seen in Figure 1. The therapist may be able to ascertain quickly that something is wrong with the patient due to the subjective and objective assessment along wither their subsequent clinical reasoning. The data gathered over sessions should be collated to best inform the therapist. This will contribute to the therapists evolving concept of the patients’ problem. Pattern recognition is an important part of clinical reasoning however this will be limited in students and newly qualified physiotherapists. Knowledge is also an important consideration. The newly qualified therapist is expected to have many more potential hypotheses in comparison to a experienced therapist. There is suggested to be differences in novice and expert therapists in the process of clinical reasoning. Although largely similar, novice physiotherapists have to go through a longer process of clinical reasoning compared to expert therapists due to lack of knowledge in comparison; and less experience in pattern recognition. Figure 2 demonstrates the clinical reasoning process of expert therapists (with at least 3 years of experience) and novice therapists (with under three years’ experience or students). Figure 2: Difference in clinical reasoning between expert and novice therapists. The patient should be an integral part of the clinical reasoning process as this can help the clinician to form hypotheses and lead towards the review of the outcome post physiotherapy intervention(See Figure 3). Figure 3: Patient involvement in the clinical reasoning process. getPTsmart - Tool to engage in the teaching and learning of clinical reasoning in a contemporary, time-independent environment that serves as a link between the classroom and clinical practice. ↑ 1.0 1.1 Higgs J, Jones M. Clinical decision making and multiple problem spaces. In: Higgs J, Jones MA, Loftus S, Christensen N. Clinical reasoning in health professions. Amsterdam: Elsevier;2008. p. 4-19. ↑ 2.0 2.1 Edwards I, Jones M, Carr J, Braunack-Mayer A, Jensen GM. 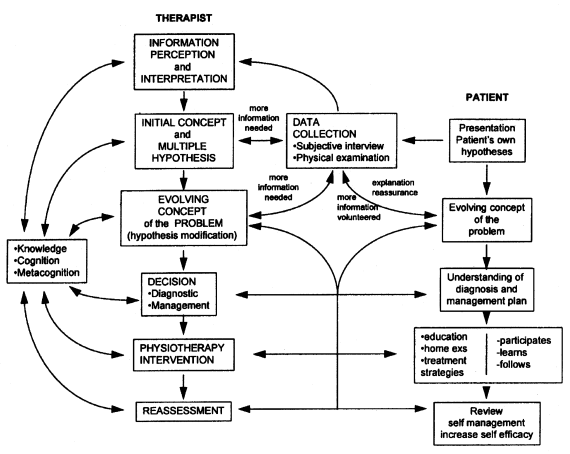 Clinical reasoning strategies in physical therapy. Physical therapy. 2004 Apr 1;84(4):312-30. ↑ 3.0 3.1 Atkinson HL, Nixon-Cave K. A tool for clinical reasoning and reflection using the International Classification of Functioning, Disability and Health (ICF) framework and patient management model. Physical therapy. 2011 Mar 1;91(3):416-30. ↑ 4.0 4.1 4.2 4.3 4.4 4.5 4.6 4.7 Jones, M. Clinical reasoning and pain. Manual Therapy. 1, pp: 17 – 24. 1995. ↑ 7.0 7.1 7.2 7.3 7.4 Doody, C. and McAteer, M. Clinical reasoning of expert and novice physiotherapists in an outpatient orthopaedic setting. Physiotherapy. 88 (5), pp: 258 – 268. 2002.